If you’re wondering what the best dining room table is for your home that’s beautiful, unique, and adds a bit of elegance, you’re in the right place. We researched some of the best-selling and top-rated glass top table designs and put together this buying guide to help you find the right design for your home. Before we get into our top picks, let’s take a look at some of the features you should know about before you start shopping. Secondary Material: Obviously, all of these tables have glass tops. But they all have interesting and unique bases that are made of things like tubular steel, wood, and brushed metal. These different materials make each table’s style unique. Size: There’s a nice variety of sizes here. Some of these tables are small enough to fit inside a small kitchen or breakfast nook. Others are large enough to seat six around the table for a big family meal. Chairs: Some of these tables come with matching chairs, which is great if you need a whole set. If you want to find a table to go with chairs you already have, there are plenty of those on our list, too. Shape: These tables come in three shapes: round, square, and rectangular. Rectangular ones are typically the largest while there are compact options that are both square and round. No matter what you prefer, there’s a few of each to choose from. Assembly Required: Here’s the bad news: all of these products come with some assembly required. Now, here’s the good news: most of them come with everything you need to put them together, including easy to follow instructions. Warranty: Warranties vary a lot with these products. Some don’t have any at all while others are covered up to two years. Read your warranty thoroughly so you know what’s covered and what isn’t. Just in case. Now that you know what to look for when trying to find the right glass table for sale, let’s move into our top ten reviews. If you’re in a hurry, start right at the top of our list with the top and budget picks. This is the best way to get an idea of the range that’s available. We found so many unique styles while putting this list together, stick around for all ten items if you can! Okay, let’s go! The Monarch Glass Dining Table is our top pick. 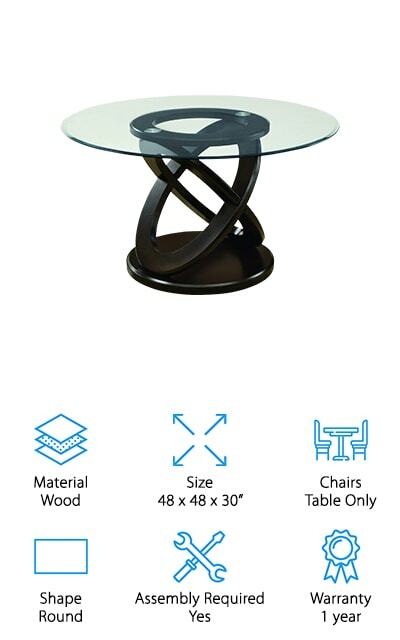 It’s a gorgeous round glass table with a gorgeous wooden base. The design for the base was actually inspired by the Olympic rings. It features two large intersecting rings that give a nod to the famous even without being too obvious. On top of the rings sits a 48-inch round tabletop made of thick tempered, beveled glass. It’s a contemporary design that adds a lot of style to any room. 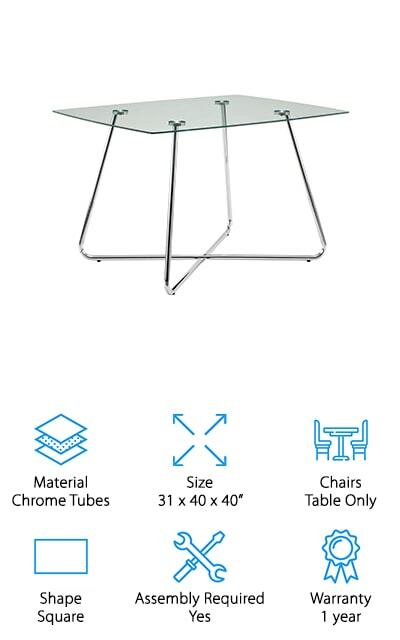 While this table does not come with matching chairs, it does provide a lot of legroom so you won’t have any problem finding some that will work. The tabletop firmly attaches to the base using metal discs that slip into the wood. Some minor assembly is required and everything you need is included. Our budget pick is perfect if you’re looking for a cheap dining room table. 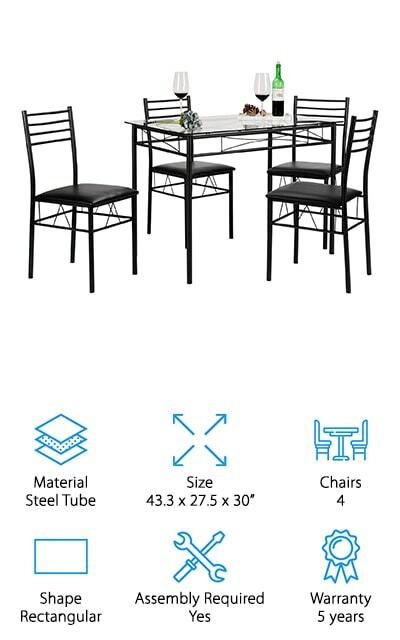 The VECELO Dining Table Set comes with a 7mm tempered glass table top that attaches to the frame with screws that are covered by sleek metallic discs. As for the frame, it’s made out of hollow steel tube that’s lightweight and durable. Another great thing about this one is that it’s more than a table. Four matching chairs are included, too. This one is a great choice if you’re looking for something that looks clean and modern but also fits nicely in a small space and tight budget. That’s not all, there are even two different colors to choose from: black with black cushioned chairs and silver with cream colored cushions. Next up is the Flash Furniture Meriden Table. This is a cool, mid-century modern glass dining table that’s built to last. The base is made of solid beechwood and is available in two different colors: espresso and walnut. Though some assembly is required, it’s pretty simple. The tabletop is 8mm thick. It comes with metal buffer pieces already attached. All you have to do is screw them into the table base. It’s held in place really well and won’t move or shift around with use. Attach the legs and your new table is ready to go. And speaking of the legs, they come equipped with floor glides that prevent them from scratching up your floor if you even need to move this table. One more thing, it includes a 2-year warranty. 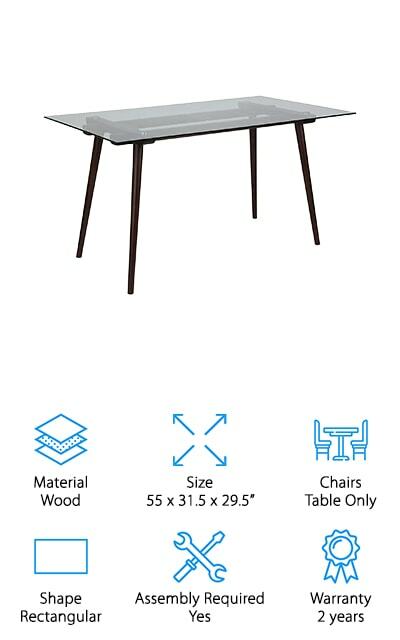 Another beautiful option is the HOMES: Inside + Out Dining Table which is perfect for anyone who is looking for a table with a bold, contemporary style. There are a lot of unique things about this design but the one that we want to point out first is the tabletop. The edges have an interesting curved design that adds a little extra flair to an already bold design. The bottom of the table consists of two square-shaped, brushed steel pillars that rest on a rectangular glass base. Overall, the matte silver of the steel combined with the shine of the glass creates a really polished looking piece. This table is large enough to seat four people comfortably but can fit up to six if need be. The Monarch Specialties Dining Table has a really simple, straightforward design that will match just about any decor. It has a square, 0.5-inch thick tempered glass tabletop that has smooth, rounded edges. The base is made of tubular chrome. The shine of the interlocked squarish legs looks great with the reflective glass top. One of the best things about this table is that it’s so versatile. Not only will it go with any kitchen or dining room decor but finding chairs to go with it will be pretty easy, too. This table seats four people comfortably. Some light assembly is required to attach the tabletop. It has metal discs attached to the underside that simply attach to the top of the legs and are then screwed in place. 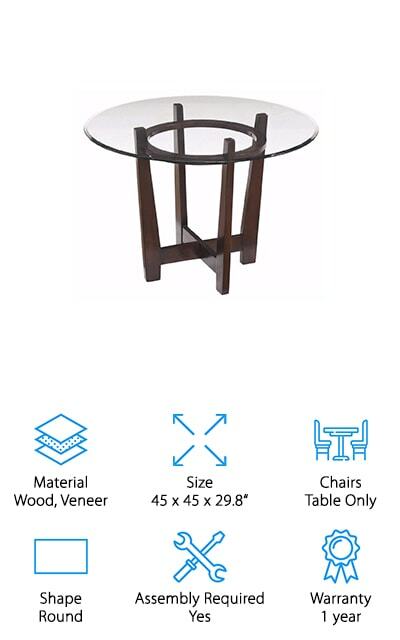 Our next pick for a glass topped modern dining room table is the Southern Enterprise Lucianna Table. The round tabletop and base create a versatile look that blends with a lot of different design styles. The metal base is powder coated dark brown with flecks of bronze highlights. Four arced legs are connected by a circular shelf at the narrowest point. While there’s not a lot of room on the shelf, it would be a cool place to put a small plant or even just to stash the salt and pepper shakers between meals. The tabletop itself is made of 8mm thick beveled glass that’s durable and easy to clean. This is a great choice if you’re looking for a glass table top for a small space. Some assembly is required. This glass dining table from Ashley Furniture has an interesting look thanks to the reverse tapered leg design. Rather than getting wider as they reach the ground, the legs on this table widens slightly as it goes from the floor to the tabletop. It has the effect of looking like it’s almost upside down but is open and airy enough that it just makes sense. It’s made of wood and veneer with a deep brown finish that’s easy to match to chairs and any room’s decor. As for the tabletop, it’s round and made of ¼-inch thick glass. Because it’s only 45 inches in diameter, it will fit into tight spaces easily. Plus, because if its airy look, it won’t overwhelm a small room the way a bulkier table wood. 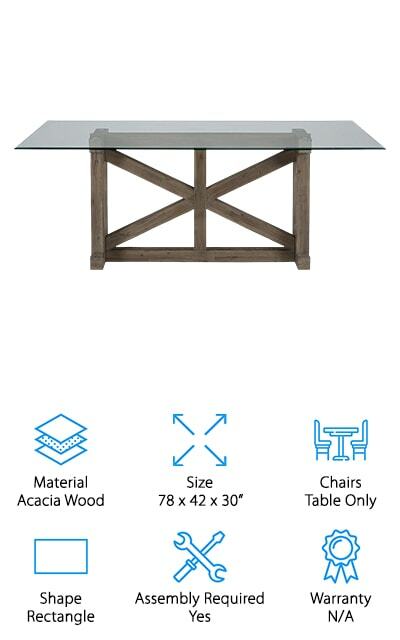 One of the things that we noticed first about this glass dining room table from Jofran is that it manages to have a rustic, industrial, and modern feel. The Hampton Road table has a large rectangular glass top with a smooth, beveled edge. It’s made of 12mm thick tempered glass and is a decent size. In fact, it’s the largest tabletop we’ve reviewed so far. The acacia wood base was designed to look like a trestle. It’s sandblasted for a gorgeous faded and worn look that plays nicely against the clean lines and clear reflections of the glass tabletop. This is a great table for someone who has an eclectic style because it works with so many different kinds of decor. That’s not all, it’s also large enough to seat up to six people comfortably. 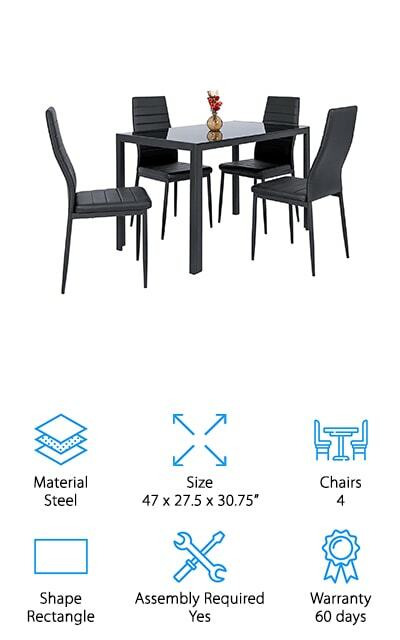 Next in our glass dining room table review is this table and chair set from Best Choice Products. The thing that stands out the most about this set is that the glass tabletop is actually tinted black, which gives it a really sleek, polished look. It has a very simple steel frame that’s rust resistant and made to last a long time. The set of four chairs features a gently curved backrest and a steel frame that matches the table base. The seats are upholstered in black ribbed faux leather. 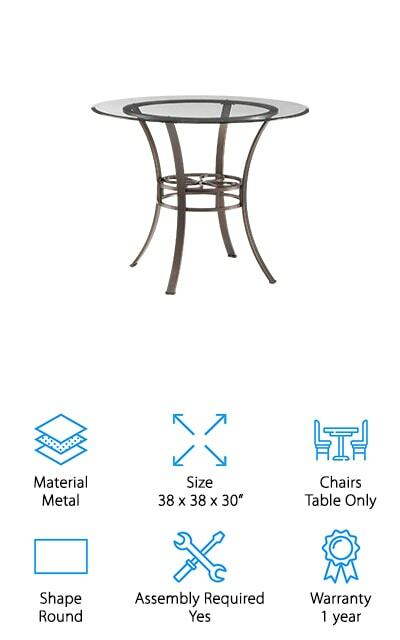 Because everything from the frames to the seat cushions to the tabletop is black, this table really stands out. It has a distinctly sophisticated look that works well with various styles. Some assembly is required. Up next is another great set if you’re looking for an awesome glass table with the chairs to match. 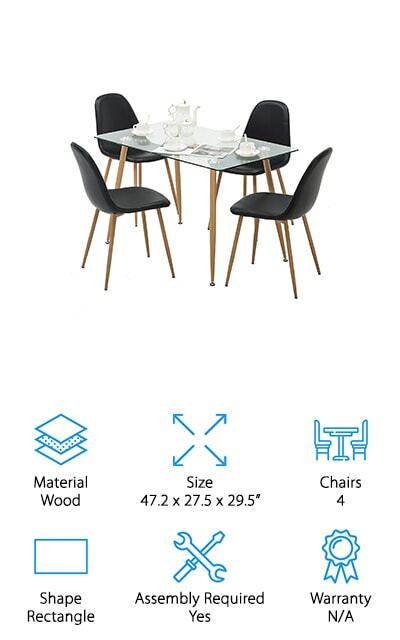 The Mecor Dining Set is perfect for small spaces. 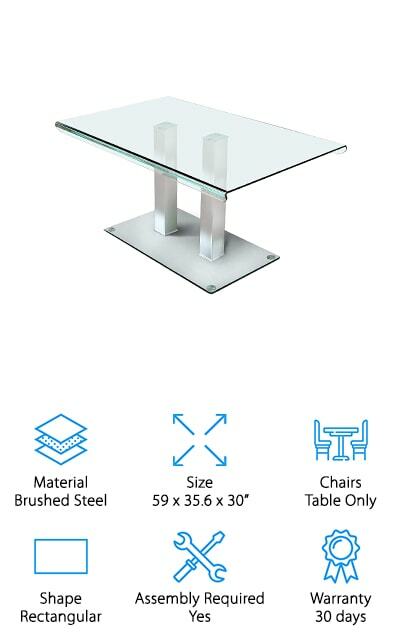 The tabletop is made of 8mm thick tempered safety glass. This is a really simple design that doesn’t have a complicated or intricate base. It simply has four wooden legs that attach directly to the glass. This table seats up to four people comfortably and comes with supportive, high back chairs that really complete the modern, minimalist look. They’re upholstered in soft faux leather that’s been coated with PU to make them water resistant. If you need to clean up a mess, it’s as easy as wiping it away. Plus, the table legs and chairs have a rust resistant finish to protect them from damage over time.